Once the hottest things in higher education, private, for-profit colleges and universities have suddenly found themselves on the business equivalent of academic probation. The for-profits ­­–– which range from beauty colleges and truck-driving schools to industry behemoth the University of Phoenix — enjoyed booming enrollment, which more than tripled from 1991 to 2011, and annual profits in the billions, corporate earnings reports and other sources show. But after years of criticism over purportedly fraudulent claims, high costs, and shady recruiting practices, the for-profits have seen deep declines in their numbers of students and been forced to slash tuition. Some have shut down or announced layoffs, and states are stepping up enforcement against questionable practices by others. Enrollment has tumbled at all colleges and universities as the number of traditional-age college students falls and the economy picks up, but the drop-off at the for-profit schools so far this year — nearly 9 percent — is almost four times as steep as at nonprofit universities and colleges, according to the National Student Clearinghouse. 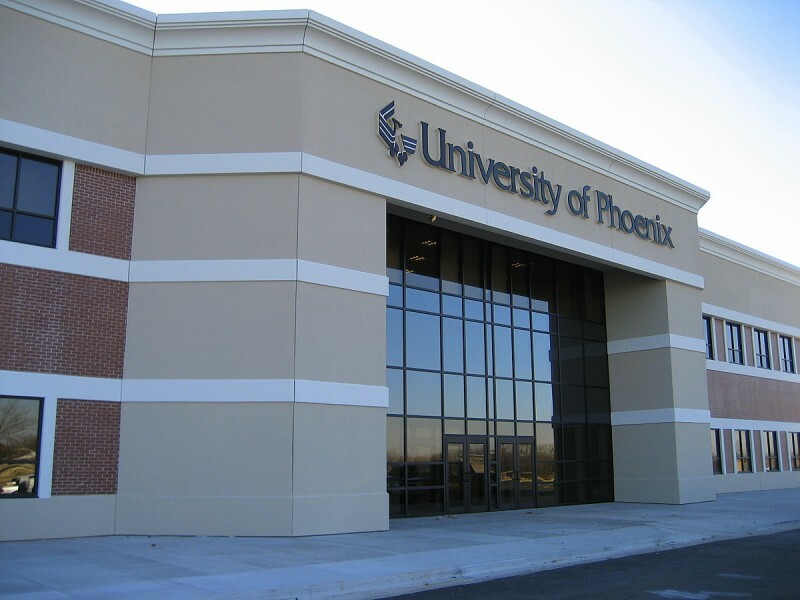 The Apollo Group, publicly traded parent of the University of Phoenix, has reported an 18 percent plunge in enrollment and a 22 percent dip in new registrations since last year, leading to a 36 percent decline in operating income. The declines come despite the fact that the for-profits quietly dropped their prices by 15 percent, on average, from the 2006-2007 to 2011-2012 school years, according to Education Sector, an independent think tank. The cuts came after years of steadily rising tuition, said Andrew Gillen, Education Sector’s research director. “It’s kind of caught a few of us off guard,” said Gillen, theorizing that the schools may have cut their charges while they regrouped in the face of tougher state and federal regulation. Although Congress has resisted proposals that would dramatically increase restrictions on for-profit colleges, some states have stepped up their efforts to stop unscrupulous recruiting and other reported problems. In New York, Attorney General Eric Schneiderman in August announced a $10.25 million settlement with Illinois-based Career Education Corp., a publicly traded chain the state accused of inflating job-placement rates to attract students to its seven New York campuses. That same month, New York sued Donald Trump and his Trump University for allegedly misleading students into believing they were attending a real university when, in fact, the school was unlicensed. The company, which has renamed itself the Trump Entrepreneur Institute, says the charges are politically motivated, and has offered testimonials from students praising the program; the case is awaiting trial in the New York Supreme Court in Manhattan. And California has cut the flow of state-funded student aid to dozens of for-profit colleges with high loan-default and low graduation rates. The three-year-old agency that monitors California’s 1,900 for-profit and vocational schools has also tightened its grip as more colleges have applied for operating licenses, and the state’s attorney general has sued publicly traded Corinthian Colleges and its subsidiaries — Everest, Heald, and WyoTech colleges — for, among other things, allegedly defrauding students with deceptive advertising that misrepresented job-placement rates. Even some federal controls are gaining traction. A new Federal Communications Commission rule that took effect in October prevents private, for-profit universities and others from making unsolicited marketing robocalls. And the Securities and Exchange Commission is investigating student recruitment and other matters at both Corinthian and Education Management Corporation, which operates the Art Institutes and Argosy University, the two companies have disclosed. “A lot of those schools see the handwriting on the wall,” said Joanne Wenzel, who directs the California Bureau for Private Postsecondary Education. But some industry leaders say the handwriting on the wall is not about enforcement, but about basic principles of supply and demand. The price cuts, for example, are responsible reactions to the country’s economic realities, said Steve Gunderson, a former Republican congressman who now is president and CEO of the Association of Private Sector Colleges and Universities. He admitted that at least some of the enrollment declines are a result of bad publicity and increased criticism, however. The rest, though, can be attributed to good business sense, he said. Unlike their traditional nonprofit counterparts, for-profit colleges are “nimble,” Gunderson said, and can more easily lower tuition to retain and attract students hit hard by the country’s economic woes. “Our schools are being responsive,” he said. More problems may lie ahead. A new report from the bond-rating agency Moody’s said for-profit universities are particularly vulnerable to changes in federal financial aid, from which they get 80 percent of their revenue. Moody’s said the private for-profits are also more at risk from greater student selectivity and public scrutiny than nonprofit institutions. American Career Institute shut down suddenly in January, stranding more than 2,200 students. Academic Enterprises, another private, for-profit higher-education company, shut down some of its campuses around the same time, leaving 650 students struggling to transfer. Education Management, which already eliminated 90 non-faculty jobs, has announced that it is cutting 500 more. The University of Phoenix, which enrolls about 300,000 students online and at more than 100 campuses, froze tuition last year for new and returning students. Around the same time, the system — owned by the publicly traded Apollo Group — closed about half its campuses. Now it’s planning to lay off 500 non-faculty employees, on top of 800 already let go. With the country’s gradual economic recovery and a decline in the number of high school graduates, plus the advent of free Web-based classes known as MOOCs — massive open online courses — the university is seeing more competition for students, said Mark Brenner, chief of staff to Apollo Group CEO Gregory Cappelli. The faltering economy, increasing educational options, and state crackdowns have combined to make more for-profit colleges pay attention to quality, experts said. Increased scrutiny, they said, is having a positive effect on the industry. It would be a mistake to rule out a resurgence in the for-profit sector, said Henry Levin, a professor at Teachers College, Columbia University and director of the National Center for the Study of Privatization in Education. The need to satisfy investors makes for a powerful incentive to innovate, he said.